Contact Us for an In-home Consultation! Custom Quality & Service for Less! Regardless of whether you are looking at covering one window or a whole house, Shutter Guy will show you how your favorite window treatments don’t have to cost a fortune and stay within your budget. You’ll find exceptional value at competitive prices, which is why Shutter Guy is your premier window covering professional in the Greater Charleston, SC area. Shutter Guy is your window treatment specialist offering custom blinds, shades, shutters, and draperies from top manufacturers such as Hunter Douglas, Vista, Graber and EcoSmart. Select from Roman, honeycomb, woven woods and roller shades to plantation shutters, vertical, wood blinds and more. We will ensure we find the perfect solution for your windows! 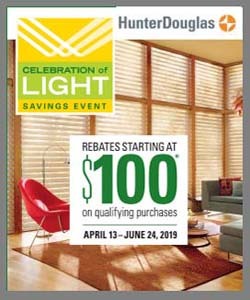 Rebates starting at $100 on Hunter Douglas qualifying select sheers & shadings. Valid: Available April 13 – June 24, 2019. Call for more details about our rebates! Are you tired of the off-the-shelf curtains that came with your home because it doesn’t align with your style and personality? Now is the time to upgrade to custom draperies. Custom made drapery is both versatile and beautiful. Soft window treatments such as flowing drapery, valances, and top treatments bring a unique style to every room.